VapCor Marine Coat 195w: Corrosion Prevention Coatings | Vapcor Inc.
VapCor Marine Coat 195W (VMC 195W) GP corrosion prevention coating is beige-colored, highly effective, single component, corrosion inhibitor. The semi-hard flexible residual film is easily applied, easily inspected and highly resistant to salt water and salt spray. VMC 195W GP corrosion prevention coating provides optimal corrosion protection for ferrous and non-ferrous metal exposed to the harsh marine environment. Ballast tanks, void spaces, coffer dams, rudder voids, double hull voids on board all types of ships. Ballast tanks, void spaces, coffer dams on offshore oil platforms and drilling support vessels. Internal surfaces of offshore oil platforms and equipment. Internal surfaces of drill pipes, sucker rods, and other oil drilling tubular products. VMC 195W GP corrosion prevention coating has numerous shipboard applications. It can be dipped, or sprayed as the recommended methods of application. Prior to application it is important to remove any loose scale, mud and silt accumulations. VMC 195W GP corrosion prevention coating will penetrate any existing rust scale. Tank surfaces should be pre-cleaned to a minimum of ST2/ SSPC-SP2, conditions. To get the most efficient use of VMC 195W GP corrosion prevention coating an SSPC-SP-12/NACE-5-WJ3 surface preparation should be used at a minimum of 8000 PSI to remove all loose rust, paint and foreign matter. Any tightly adhered rust, paint and hard coatings are permitted to remain. VMC 195W GP corrosion prevention coating will penetrate the adherent rust and over a period of time remove it. Re-application of VMC 195W will be required where the tightly adherent rust has been removed. It is recommended so as to ensure consistent protection is maintained that the tanks coated be inspected on a yearly basis. This will ensure that the coating integrity is maintained by regular touch-ups. This can be arranged by your local VapCor Inc. representative in a service port. The most effective and efficient method of application is A 33:1 airless spraying unit, using between 0.017 inch and 0.021 inch nozzle tip, the most efficient way to set the pressure on an airless gun is to start from zero and increase the pressure on the pump until you get a pattern that is free from fingers or trailers on the out side of the pattern. When you set the pump up in this manner you are atomizing at the lowest pressure possible, practically eliminating bounce back off of the substrate and reducing over spray. This will maximizethe transfer efficiency of the airless pump. When spraying in the confined area of a ballast tank there will be less fog floating in the tank around the operators. Depending on spray distance – the closer spray distance, the smaller the tip size. Mild agitation of the drum contents is recommended prior to use. A dry film thickness of 4 mils is recommended (wet film thickness of 5.97 mils). This coverage is 1 ltr. per 6 m² (1USG per 228 fr²) of new steel or 4.8 m2 (1USG per 190 ft²) of clean rusted steel. The best method of application on old steel, is in the presence of the applicators use 2 magnetic pads, spray 195W on and between them (about 3 feet apart) and then measure the thickness of the coating on the pads as they are the only truly flat surfaces which can be measured. The visual seen of 195W on the rusted surfaces will be the template for further application. Good ventilation & air circulation is required. No open flames. Use a negative pressure face mask to minimize inhalation of fumes. Prior to application all loose dirt or oil should be cleaned off the area to be coated. Application should be done at a temperature between 10°- 40°C (50°-104°F). VMC 195W GP corrosion prevention coating will dry to touch in 24+ hours in most enclosed moist areas. Wet surfaces will negatively affect the application, moist surfaces will not. In any case you will be able to ballast in 24 hours with out loosing any of the coating material, however the drying and curing process will be impeded. It is recommended that after application is complete, the coating is allowed to cure for 72 hours with good ventilation & air circulation. VMC 195W GP corrosion prevention coating can be removed by a high pressure alkaline hot water wash down or if hot water is not available then brushed on mineral spirits can be used. This private label product has been formulated and manufactured by Daubert-Chemical. 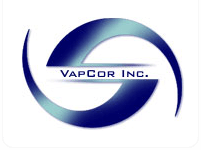 For VapCor Inc. Daubert Chemical maintains Material Safety Data Sheets on all its products. Material Safety Data Sheets contain health and safety information for the user of the product to develop an appropriate product handling procedure to protect the user and all company employees and customers. Before using Daubert Chemical manufactured products in your facilities the Material Safety Data Sheets should be read and understood by all your supervisory personnel and employees. WARRANTY: Daubert Chemical Company, Inc. (“Daubert”) warrants all products manufactured by it to be free from defects in material and workmanship. DAUBERT MAKES NO OTHER WARRANTIES, WHETHER, EXPRESSED OR IMPLIED, WITH RESPECT TO SUCH PRODUCTS, AND ALL OTHER WARRANTIES, EXPRESSED OR IMPLIED, INCLUDING, BUT NOT LIMITED TO, THE IMPLIED WARRANTIES OF MERCHANTABILITY AND FITNESS FOR A PARTICULAR PURPOSE AND IMPLIED WARRANTIES ARISING FROM A COURSE OF DEALING OR USAGE OF TRADE, ARE DISCLAIMED BY DAUBERT. All claims hereunder must be made in writing within 30 days after receipt of the products at the buyer’s plant and prior to further processing the products or combining them with other materials or products. Daubert’s liability, whether under this warranty or in contract, tort, negligence or otherwise, is limited to the return of the net purchase price paid for any products proven defective or, at Daubert’s option, to the repair or replacement of said products upon their return, transportation prepaid, to Daubert. THE REMEDY HEREBY PROVIDED SHALL BE THE EXCLUSIVE AND SOLE REMEDY OF THE BUYER, AND UNDER NO CIRCUMSTANCES SHALL DAUBERT BE LIABLE FOR CONSEQUENTIAL OR INCIDENTAL DAMAGES. No Daubert representative or other person is authorized to change this warranty in any way or to assume for Daubert any other liability in connection with the sale or use of its products.